Vlad Tkachiev continues his alternative look at the World Championship match in Sochi by describing how Magnus Carlsen’s moves to build up an attack in the second game reminded him of the motion of the Prague Astronomical Clock, with the queen playing the role of the skeletal figure of Death. Tkachiev also talks about pattern recognition in chess in general and how previous games influence our play. So then, this is the fourth post in Vlad’s new blog ChEsSay, translated with permission from the Russian original. What does chess develop first and foremost: logic, calculation, creative faculties as a whole or at least perseverance in particular? Clearly none of the above, since opposite-coloured bishop endgames occur in your practice only once every few years, or even less, and calculating with great intensity is required in far from every game. The majority of us wouldn’t have the heart to describe our play as creative, while TV series or computer games keep us rooted to our seats far more reliably. For me, for example, it’s easier to think on the move. Then what? It’s long since been established that chess develops above all image recognition. Whether consciously or not, we review images we’ve seen, passing them through our personal internal pattern engine. I’m not hinting at our silicon friends by accident: it was precisely pattern recognition — used as a lever by Turing and Botvinnik, that laid the foundations of cybernetics and artificial intelligence. And now us chess players are ahead of the whole planet when it comes to using computer engines as our supreme authority 64 times a day. When will the rest of humanity get the chance to consult a program: where did I go wrong with my girlfriend? Or: what exactly did I blurt out wrongly in the pub yesterday to wake up bruised after a rough weekend? For us, everything’s much simpler, and everyone knows how strong 42…Re3 was in the first, or 20.Bh6 in the second game of the Carlsen-Anand match. I got a little distracted, but we’ll soon get back to the game. The difference between outstanding players and the rest consists in an ability to single out the necessary image from the huge quantity of those potentially available and then manage to reproduce it on the board, despite fierce resistance from your opponent. When that works out you feel a rare sense of harmony. For me that occurred while watching the 2nd game of the Carlsen-Anand match from moves 10 to 20. The play develops first on the queenside, then soon in the centre, and then it suddenly switches to the kingside — just like the figures of the apostles before the eyes of the stunned public. The queen going to h5, meanwhile, performs the role of the skeletal emissary of Death. It’s no surprise it was precisely the move 35.Qb7 that brought the game to a close. After the game Carlsen readily admitted the “opportunistic” nature of the attack he carried out to reach a won heavy-piece ending, although it seems 18…Qf7 would have held. After that he philosophically added: “You cannot win without mistakes in chess”. Well yes, harmony in music is always born from the combination of consonance and dissonance, while in chess — it’s from the predominance of one player over another. Otherwise there’s a draw, nothing — a result that according to Fischer should be abolished. A child taking his or her first steps in chess aims in every game with the white pieces for the weak point on f7. 1.e4 e5 2.Qh5 Nc6 3.Bc4… until he gets disillusioned. 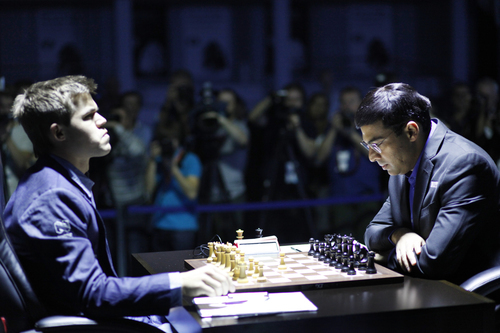 The World Champion Magnus Carlsen on Sunday won after throwing everything he could at the neighbouring g7-point.